Four years before any actual lunar landing and two years after the The Mouse on the Moon Lucio Fulci delivers what could be considered a topical slice of cold war Eurospy comedy as Franco and Ciccio, two petty Sicilian criminals, are kidnapped by the Soviets and fired into space in a Cold War ruse designed to convince that two Cosmonauts, also played by Franco and Ciccio have not in fact perished in space. Opening with an extended series of sight gags to a Coriolano Gori, here credited as Lallo, jazz score that could be compared to that of Henry Mancini in Pink Panther mode, the Capricorn One style set up allows for a farce segment where both Soviet and Sicilian pairings end up in the house of two unsuspecting wives. 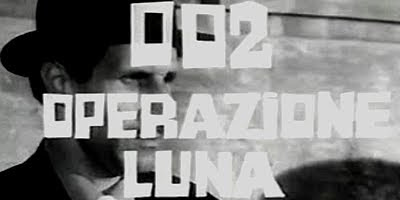 Eschewing, for the main part, political humour to instead revel in the absurdity of situation, 002 operazione Luna nevertheless remains topical with a scene involving the drifting bones of Cosmodog Laika and references to the ability of the law to protect citizens. Political subterfuge comes to the fore as does suggestions of state brutality as the Soviets attempt to clear up the mess they made as two rockets, Popov one and two, return to earth despite the former being initially considered lost. Franco Franchi gurns and howls in his typical Norman Wisdom meets Jerry Lewis kind of way but again such annoyances are eclipsed by quality writing and an abundance of fun and interesting ideas. 002 Operation Moon, while now topically redundant, would not have been seen as anachronistic in an era when Operation Gladio was still very much still live and superpowers fought it out for the hearts and minds of the European populace. This is a fascinating comedy from an interesting time in world history.